If you have any pictures of our current 5th graders when they were in kindergarten at Geer Park, please send to their classroom teacher or to timpfm@dearbornschools.org. You can also send them through text to 313-407-6610. The student of the month for March is Taj Ghanem! Taj was chosen by her peers to be student of the month. She is a hardworking student. She shows integrity and is respectful to all. She is responsible, motivated and is always on task. She follows all the core values. She shows kindness to all of her classmates. This week, I spoke with our students about all of the exciting events we have planned for the end of the year, a sort of spring re-start. The PTA, teachers and myself spend a lot of time and funding to create celebrations and trips to acknowledge their hard work all year. We also discussed that, in order to have the time for these events, our focus and stamina during instruction is critical. Our plan is a “give and take”. If a student takes time during instruction with off task behaviors, then they need to give that time back during a celebration. This is not a punishment – we are teaching Choice Theory, teaching students about how (1) their choices affect the teaching and learning for all others and (2) that their education is our collective focus. I believe that while we are focused on academics, students’ long term academic success cannot be realized without responsibility, organization and respect for self and others as a foundation. Without these traits at the forefront of their intent, the learning process will be interrupted and less rigorous for all. The way this will work is if a student is interrupting the learning for themself or his/her peers, the teacher will log the number of minutes taken away from the classroom and these minutes will then be added together. The students will give these minutes back during non academic events, such as field day. The individual teachers will use their discretion about when these minutes will be given back. The students agreed that this is a fair plan, as their input was taken. We also came up with “advice columns” to share with their peers. I thank you in advance for your support. If you have questions, please see me. تحدثت هذا الأسبوع مع طلابنا عن جميع الأحداث المثيرة التي خططنا لها في نهاية العام ، وهو نوع من بداية الربيع. تقضي PTA والمعلمون وأنا الكثير من الوقت والتمويل لإنشاء احتفالات ورحلات للاعتراف بعملهم الشاق طوال العام. ناقشنا أيضًا أنه من أجل توفير الوقت لهذه الأحداث ، فإن تركيزنا وقدراتنا على التحمل أثناء التدريس أمر بالغ الأهمية. خطتنا هي “عطاء وأخذ”. إذا كان الطالب يستغرق وقتًا أثناء التدريس بسلوكيات مهمة ، فيجب عليه إعادة ذلك الوقت أثناء الاحتفال. هذه ليست عقاب – نحن نعلم نظرية الاختيار ، ونعلم الطلاب كيف (1) تؤثر اختياراتهم على التعليم والتعلم لجميع الآخرين و (2) أن تعليمهم هو تركيزنا الجماعي. أعتقد أنه بينما نركز على الأكاديميين ، لا يمكن أن يتحقق النجاح الأكاديمي للطلاب على المدى الطويل دون المسؤولية والتنظيم واحترام الذات والآخرين كأساس. بدون هذه الصفات في طليعة نواياهم ، سيتم مقاطعة عملية التعلم وأقل صرامة للجميع. الطريقة التي ستعمل بها هي إذا قاطع أحد الطلاب التعلم لنفسه أو أقرانه ، وسيقوم المعلم بتسجيل عدد الدقائق التي يتم أخذها من الفصل وسيتم إضافة هذه الدقائق معًا. سيعيد الطلاب هذه الدقائق خلال الأحداث غير الأكاديمية ، مثل اليوم الميداني. يستخدم المعلمون الفرديون سلطتهم التقديرية حول موعد رد هذه الدقائق. وافق الطلاب على أن هذه خطة عادلة ، حيث تم أخذ مداخلاتهم. لقد توصلنا أيضًا إلى “أعمدة المشورة” لمشاركتها مع أقرانهم. اشكركم مقدما على دعمكم إذا كان لديك أسئلة ، يرجى رؤيتي. Geer Park will offer your child many upcoming field trip opportunities. You will soon be receiving more information about each of these opportunities and a permission slip if you should choose to allow them to participate. Students are expected to work hard and uphold the Core Values at all times: Responsibility, Respect for Self and Others, Courtesy, Honesty, Integrity, and Citizenship. They must demonstrate what it means to be a Geer Park Star at all times. If your child chooses to demonstrate a lack of responsibility, they are choosing not to participate in one of the three field trips planned. We will be using the letters that spell out “field trip”. Every two clip moves within a week, will result in a loss of a letter. If they lose all the letters in a field trip, they will not participate in that field trip. Our goal at Geer Park is to make your child’s educational experience fun, engaging, and interactive. We want all students to have opportunities to be a part of the community and family atmosphere we strive to create. Please discuss the importance of positive behavior and good decision making skills so that your child does not miss out on these special activities and events. سوف تقدم مدرسة جير بارك لطفلك العديد من فرص الرحلات الميدانية القادمة. ستتلقى قريبًا مزيدًا من المعلومات حول كل من هذه الفرص الميدانية وقسيمة إذن إذا كان عليك اختيار السماح لها بالمشاركة. من المتوقع أن يعمل الطلاب بجد والتمسك بالقيم الأساسية في جميع الأوقات: المسؤولية ، واحترام الذات والآخرين ، والمجاملة ، والصدق ، والنزاهة ، والمواطنة. يجب أن يوضحوا ما يعنيه أن يكونوا نجم في جميع الأوقات. إذا اختار طفلك إظهار عدم المسؤولية ، في يختارون عدم المشاركة في واحدة من الرحلات الميدانية الثلاث المخطط لها.سنستخدم الحروف التي توضح “رحلة ميدانية”. كل مقطعين يتحرك في غضون أسبوع ، سوف يؤدي إلى فقدان بريد إلكتروني. إذا فقدوا جميع الحروف في رحلة ميدانية ، فلن يشاركوا في تلك الرحلة الميدانية. هدفنا هو جعل تجربة طفلك التعليمية ممتعة وجذابة وتفاعلية. نريد أن تتاح لجميع الطلاب الفرص ليكونوا جزءًا من جو المجتمع والأسرة الذي نسعى جاهدين لإيجاده. يرجى مناقشة أهمية السلوك الإيجابي ومهارات صنع القرار الجيدة حتى لا يفوت طفلك هذه الأنشطة والفعاليات الخاصة. How are students prepared in school? How can you prepare your child at home? When will my child be taking MSTEP? Describe Eastern Woodland American Indian Life. Include government structure, family structure, trade, property ownership, and land use. Compare settlement patterns and describe development in the Southern colonies. Compare settlement patterns and describe development in the New England colonies. Compare settlement patterns and describe development in the Middle colonies. The student of the month for February is Hassan Nasser! 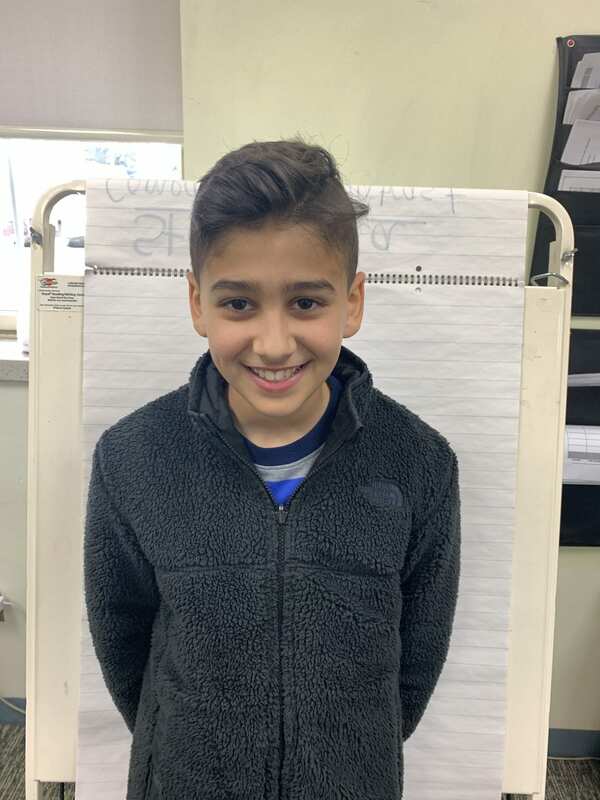 Hassan was chosen by his peers to be student of the month. He is responsible, motivated and is constantly on task and ready to learn. He always works hard and follows direction. He has been following all the core values. He has been always focused and willing to lend a helping hand. 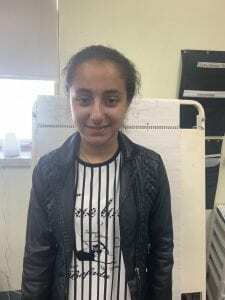 The student of the month for January is Rima Alshami! 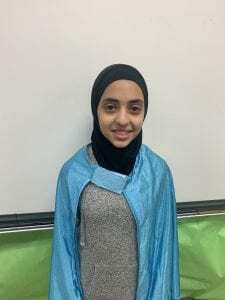 Rima was chosen by her peers to be student of the month. She is a hardworking student. She shows integrity and is respectful to all. She is responsible, motivated and is always on task. She follows all the core values. She shows kindness to all of her classmates.